CADD Professor Eli Vestich of SSU’s Computer Aided Drafting and Design program. 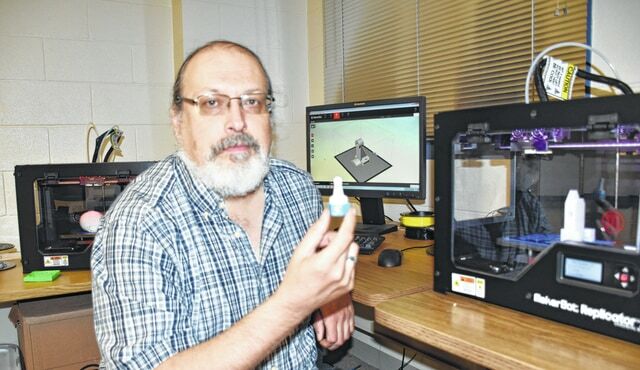 The Computer Aided Drafting and Design (CADD) and Plastics Engineering Technology programs at Shawnee State University will integrate new courses, such as Prototyping and 3D Printing and Additive Manufacturing, to its already existing program and will be available for the 2015 Fall Semester. The CADD program’s Associate of Applied Science degree will offer a new CADD Manufacturing track, which includes courses such as Prototyping, 3D Printing and Additive Manufacturing, as well as concentrating on traditional metal and plastics manufacturing processes. This new track will make it possible for CADD Manufacturing graduates to easily continue into the Plastics Engineering Technology program for students trying to obtain a Bachelor of Science degree. Additive manufacturing, commonly known as 3D printing, is an emerging technology in advance manufacturing. The applications of additive manufacturing are multi-disciplinary and are linked to several of the key industries identified by JobsOhio. Computer aided drafting and design and prototyping are critical skills that are practiced with additive manufacturing technology. CADD Professor Eli Vestich offered the first of these courses during the 2015 Spring Semester with positive results. “The spring semester saw the first prototyping and 3D printing courses and students began by identifying a need that could possibly develop into a useful tool or product. They created a succession of prototypes through CAD modeling then created traditional prototypes using wood, metals, fabric and 3D printing. It was a very enthusiastic group and the course went exceptionally well,” said Professor Vestich. Professor Vestich has been working closely with the Plastics Engineering faculty to develop a Fabrication Lab where various advance manufacturing technologies can be utilized, such as Fused Deposition Modeling (printing plastic through an extrusion head layer by layer) and Stereolithography (creating a sold part from a liquid polymer by exposure to UV laser). For more information about the CADD and the CADD Manufacturing track, contact the Engineering Technology Department at 740.351.3224.